Taitung County, located on the southeastern side of Taiwan, has a steady year-round climate, thanks to its geographical location and the Pacific Ocean's Kuroshio Current, which brings warm weather and seas to the area. With abundant resources from the Central Mountain Range, the county rarely, if ever, suffers from lack of water. Because of this good fortune, and the fact that the soil here is nutrient rich, Taitung is wonderfully suited for agriculture. Lanyu and Green islands, off the coast of Taitung, are Taiwan's only islands situated in a rainy, tropical zone, making them very fertile. Besides high-quality rice that enjoys a good reputation all over Taiwan, Taitung is well-known for sugar apples, tea leaves, day lilies, roselle, wentan pomelos, and moth orchids. The plains and valleys surrounding the southern tip of the Central Mountain Range is Taitung's granary, as towns like Chihshang, Guanshan, and Luye, produce wholesome rice and grain. The higher elevation, industry-free environment and frequent rainstorms, coupled with large temperature changes between night and day, make the products grown here top quality. Sugar apples from Taitung are very well-known and popular throughout Taiwan, as well. These fruit have two or three times the pulp of sugar apples grown in other parts of the island, and their growing season goes from mid-summer to the beginning of spring. The start of the season also sees roadside vendors springing up along highways and brings tourists to taste this pulpy, honey-flavored fruit. Two Taitung locations, "Fulu Teas" in Luye and Taifong High Mountain Teas" in Taimali and Jinfong, grow tea. They mostly grow Oolong, Jinxuan, and Cuiyu teas. Farmers from the area usually pick their tea far more often than other tea-growing regions. The "Bujhihchun" early-spring tea and "Dongpian" late-winter teas each have their own unique flavor. Taifong High Mountain Tea is grown at a higher elevation and is a special variety of Oolong that has a translucent color and a sweet, dry aftertaste. It's considered one of the highest quality teas on the island. 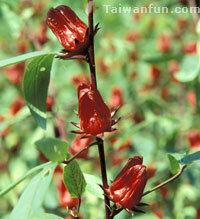 Roselle is another specialty treat from Jinfong, Taimali, Beinan and Taitung City; it's used in refreshing summer drinks, jams, tea bags, liquor and snacks. There is plenty of farm produce grown in Taitung county as well. Apart from rice, sugar apples, tea leaves and roselle, other fruit like bananas, watermelons, pears, plums, coconuts, navel oranges, tangerines, wentan pomelos, white shaddocks, papaya, Chinese dates, mangos and avocados are cultivated. Millet and corn, as well as other vegetables like tomatoes, green peppers, cabbage, baoshin white cabbage and shansu, are also scatted around the farms here.